VMware vExpert 2016 recipients have been named, and I'm happy to find that I've made the list again this year, my 3rd year. joining the 919 other vExperts out there. It's quite the list, check it out! I didn't really know anybody well inside VMware at the time, but Scott March helped me out there, a guy I met at a vBeers who wound up working at VMware. That story is detailed in my first vExpert post. Thank you again, Scott! Being a vExpert is really way more than what I've expressed so far. I haven't done it justice. Here's some more thoughts. Getting to meet senior level VMware employees at VMUGs and at a special get together at VMworld 2015, along with a zany dinner with Rawlinson Rivera (@PunchingClouds), Brian Graf (@vBrianGraf), Emad Younis (@Emad_Younis) and the VMUG Boston leaders (thanks Greg over at VMUG HQ!). Just some examples.. Most of the time, this is a good thing, an honor. Yeah, it does mean more email that I can't even keep up with anymore. But that's OK. I write about what I want to write about, and make all the decisions about who I choose to write about. I turn down a lot of offers for sponsored posts and the like. I just write stories about software and hardware that I find of considerable practical value for my home lab, then I publish the details that might be useful for others to learn about. Simple. What more can I say, the hardest working guy at VMware regularly keeps vExperts up to date on the latest big doings at VMworld, including the big announcements on Feb 9/10/11/16th, detailed here. When doing any kind of consulting, it's nice to have some logos, on the email footer, and on business cards. A great conversation starter. So there you have it, another year of acknowledgment from VMware that I'm helping make a difference. Hopefully helping others on their path to trying out virtualization, and the ever growing, and increasingly complex, ecosystem that's grown around it. 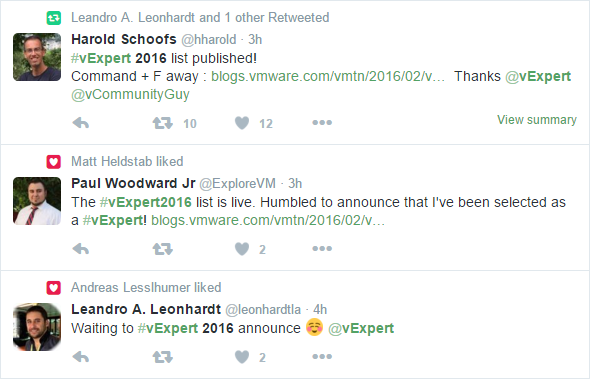 It would seem Corey Romero may have done a soft announcement of the vExpert 2016 member list this year. Let me explain. We vExperts had a heads-up a while back that Friday, February 5, 2016 would be the day of the announcements. Yep, it would seem the post got indexed by them Google bots up to 7 hours before the first Tweet. Way to go, Paul Woodward Jr., perhaps the first to spot Corey's post and tweet about it!